Once again we of the St. Stanislaus Memorial Post and Unit No. 1771 are proud to be able to march through the streets of Greenpoint honoring our dead. After which, we will have our annual Memorial Mass held in the St. Stanislaus Kostka Church. This is our tenth annual Memorial Mass. We feel, as Legionnaires It is our sacred duty to immortalize our dead. We honor those who died while in service of our country and those who died after leaving the service. We have many duties in the Legion such as child welfare, Americanism, Veterans rights, rehabilitation, etc. But one of our prime duties is to remember our dead. They have gone before the Supreme Commander and it is only fitting that we join their families in honoring them. The American Legion is celebrating its 40th Birthday starting March 15th and we feel that this is a wonderful day to honor our beloved dead. Because our dead made it possible for us to live in a free country, they helped us to remain victorious and free from slavery. We all must keep in mind that they paid the supreme sacrifice for our freedom. Please join us in honoring our dead and your dead. We will have circulars given out along our line of March. Please fly “Old Glory” on that day. You, too, are a part of our plans – won’t you join us? Attend our Mass and pray for the souls of the veterans who hate gone beyond the Great Divide. As long as there is an American Legion you call be assured that our dead and your dead will never be forgotten. We are a 19;rge organization with a strong wish to always remember the dead – young and old “God Rest Their Souls”. We would like to thank our Chaplain, Father Rufus Wicelinski, O.F.M., for once again coming to our Memorial Mass and giving us one of his wonderful sermons. We also thank the Pastor, Father Francis HIadki for permitting us to have our Memorial Mass in his Church. In closing I, on behalf of a grateful Country, Post and Unit, offer up this Memorial service for our glorious veterans who have departed from this world to a much better world in Heaven. April 3rd is the most important day of the year to us as Post Members. It is important to us because it is the day of the year that we will come out in public and honor our Post and community dead who were servicemen or veterans. We honor our dead in every deed and action, We honor our dead all our waking hours. The reason we come to the public On this day is to remind them to honor the dead the way we do. We know the dead are easily forgotten, especially the men who died since they left the service. It is a human tendency for people to forget. it is usually the family of the men or women who have died, who continually Remember. We of veterans organizations like ours are dedicated, to the veteran dead or alive. We come to the public once again to help us pay Homage to our dead. It is people like those who died that made our country safer for Democracy or helped build our wonderful country after they left service. These men and women will never be ‘forgotten as long as there is an American legion, But it is not enough to just ‘remember them ‘n “Our Memorial Day” or “May 30th” of every year. That is why we come to you every year and remind you to offer prayer for them every day. Honor them as you would honor any hero because they were the backbone of our nation. As I said before we know it is easier to forget than to remember. But we feel if we ‘come to you each year and ask you to offer prayer with us, some of you will follow our footsteps and make it a sacred duty everyday to ask God, to remember the dead of the country who served for our country. As a point of interest, I would like, to inform ‘the pubic who do not belong to our Post that we have a bell in our Post that has the name’s of all the deceased members of the Post inscribed upon it. ‘We are the only Post in Kings County that has done this. Every time the bell is struck at meetings or to bring order or at wakes the men whose name are upon the bell are honored. This bell is, used at most gatherings. Therefore, as a body we cannot and will not forget “Our own dead”. As in, the past, we will march through the, streets of Greenpoint. We would like, to have as many people as possible, fly flags from their windows, whether it be a large flag or a small hand flag on a stick. This would be your way of joining us in honoring your dead and our dead veterans. In these times of trials and tribulations with foreign powers let us show them that in the midst of all this, we will never forget our dead. By remembering the ones who have gone beyond and who at one time helped make this country what it is today, we, are remembers the dead ‘Of all wars who built the foundations of the most wonderful country in the world – the United States of America. Join us by watching us march in honor of our dead. Join us at the Most Holy Sacrifice of the Mass on April 3rd 1960. So Judas having gathered together his army, came into the city Odollam: and when the seventh day came, they purified themselves according to, the custom and kept the Sabbath in the same place. And the day following Judas came with his company, to ‘take away the bodies of, them that were slain, and to bury them with their kinsmen, in the sepulchers of their fathers. And they found under the coats of the slain some of the donaries of the idols of Jamnia, which the law for biddeth, to the Jews: so that all plainly saw, that for this cause they were slain. Then they all blessed the just judgment’ the Lord, who had discovered the’ things that were hidden. And so breaking themselves to prayers ,they besought him that the sin which had been committed might be forgotten. But the most valiant Judas exhorted the people to keep themselves from sin, for as much as they saw before their eyes what had happened because of the sins of those that were slain. And making gathering, he sent twelve thousand, drachmas of silver to Jerusalem for sacrifice to be offered for the sins of the dead, thinking well and religiously concerning, the resurrection, (for if he had not hoped that they that were slain should rise again, it would have seemed superfluous and vain to pray for the dead), and because he considered that they who had fallen asleep with godliness had great grace laid up for them. It is therefore a holy and wholesome thought to pray for the dead, that they may be loosed from sins. An estimated 105,000 marchers paraded on 5th avenue Sunday in the annual Pulaski Day parade. Bright autumn skies encouraged a turnout of an estimated 350,000 onlookers who viewed the parade, a tribute to American Revolutionary War hero Brigadier General Casimir Pulaski. Paraders carrying placards and banners protesting communist enslavement of Poland marched past St. Patrick’s Cathedral and the reviewing stand on the Public Library at 41st street. Church dignitaries watched the parade from the cathedral steps while other officials saw, it from the reviewing stand. Included among reviewers were Mayor Wagner, Governors Robert B. Mayner, and Mennen Williams of New Jersey and Michigan, respectively; Lieutenant Governor Malcolm Wilson Army Secretary Wilbur M. Brnckner. 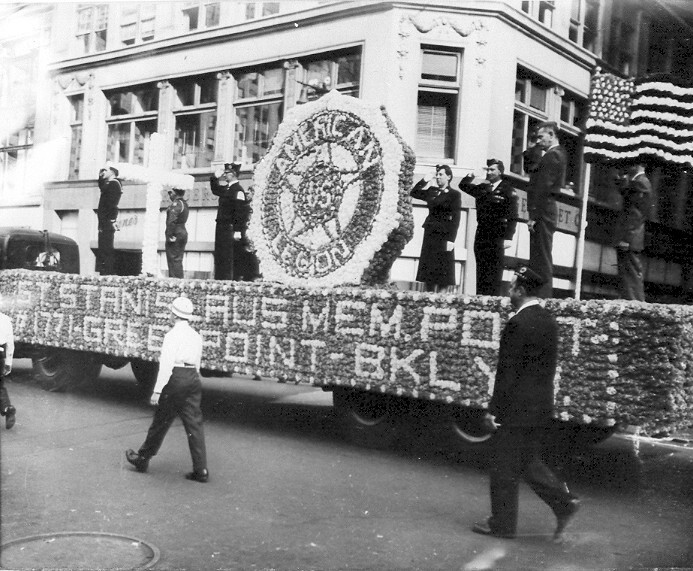 Marshal of the Greenpoint paraders was Leon F. Klementowicz. The Rev. Francis Grochola, assistant at Our Lady of Consolation Church, headed the Williamsburg group. GARDEN SPOT participants included the united societies’ of St. Cyril and Methodius and St. Stanislaus Kostka Roman Catholic churches. 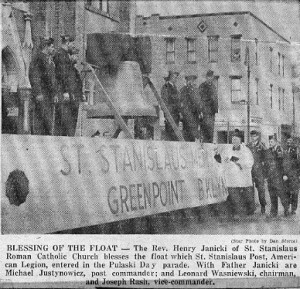 A float was again entered by, St. Stanislaus Memorial Post, American Legion. Following the parade, about 100 war veterans continued on to Untied Nations plaza at First Avenue and 47th street where they sang patriotic Polish songs for five minutes. Grand marshal of the parade was Rt. Rev. Msgr. John S. Felczak of Orange County. A banquet followed in a Manhattan Hotel. Vigilance against communism will be keynoted Feb. 18 a Greenpoint anticommunist rally sponsored by St. Stanislasus Memorial American Legion Post, according to Richard Fitzgerald, commander. Among featured speakers at the rally, set for 8 P. M. at 261 Driggs avenue, will be Dr. Bela Fabian, chairman of the Hungarian Association of Former Political Prisoners. Dr. Fabian, a former member of the Hungarian Parliament was imprisoned during World War II by the Nazis and subsequently by the Hungarian communist regime. Other speakers, scheduled include James Curran and Daniel O’Connor, past commanders of the Kings County American Legion, Dr. Leon F. Nadrowski and other Greenpoint political and civic figures. Fitzgerald said that an invitation to speak has also been sent to Congressman Victor L. Anfuso, Greenpoint Democrat, a long time foe of communism. Fitzgerald noted that the rally was no planed as a purely legion activity, but one in which he hoped every Greenpointer would participate.